With nearly five open jobs for every available software developer, the need for qualified technical talent is higher than ever. I have seen this claim repeated many times, with different numbers cited, but I've not been able to get down to any underlying factual source for these claims. In this case, the article links to another non-authoritative press article about agile developers. Does the number of open jobs surpass the number of developers "on the market"? Does this depend on skill or experience? A report which was issued by the Economic Policy Institute in 2013, analyzed the science, technology, engineering, and mathematics (STEM) labor market and workforce and the supply of high-skill temporary foreign workers, who serve as “guestworkers.” A programmer (or a software developer) is indeed in the core of this market. In our research we find that there is no lack of domestic graduates or existing domestic STEM workers to fill available STEM jobs. 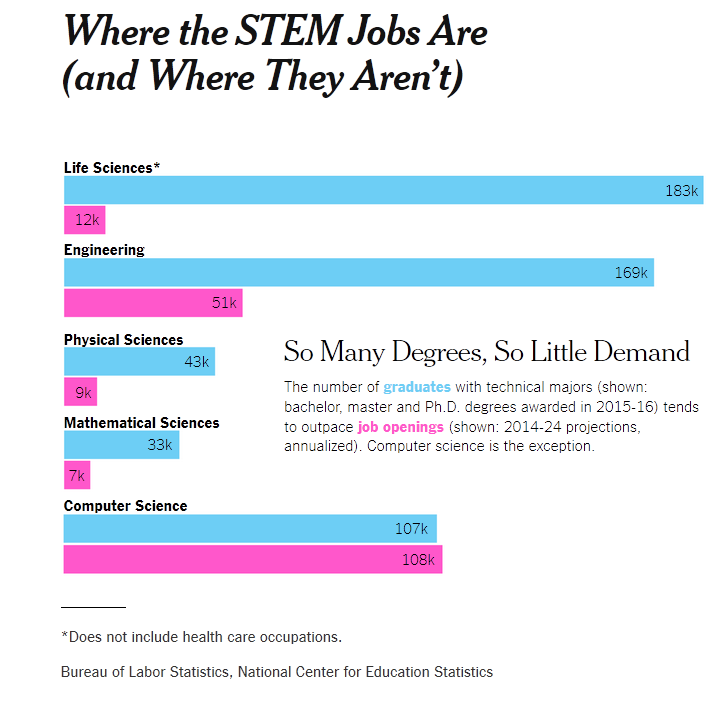 But it turns out that the job gap and growth opportunity is in computer science, not in STEM. 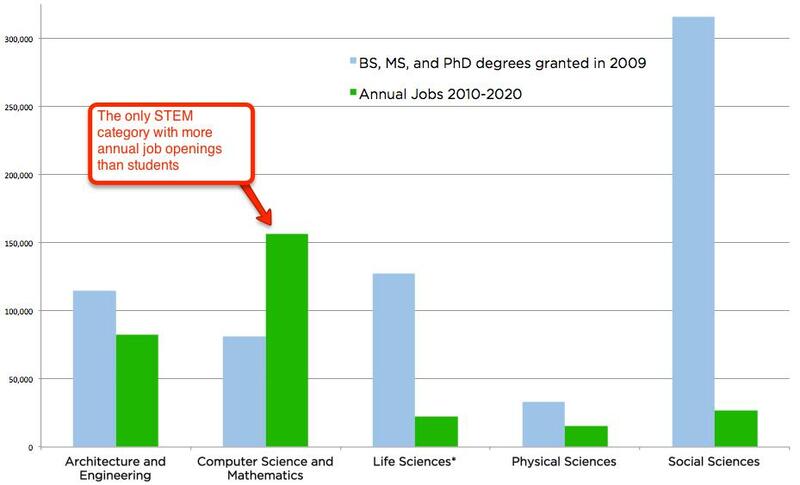 According to the chart below, computer science is the only STEM field where there are more jobs than students. The data below comes from the National Science Foundation, comparing jobs data and projections from the Bureau of Labor Statistics to student data from the National Science Foundation. Despite all of the excitement STEM, it turns out that when you exclude computer science from STEM, you see that the remaining STEM fields have too many students, and not enough jobs. From the 2010 - 2012 report from the Bureau of Labor Statistics, http://www.bls.gov/, across all industries we are adding 136,620 jobs per year in computing. Subtract 40,000 annual computer science graduates (see NSF data below) and you get roughly a gap of 100,000 jobs. 100,000 jobs adds up over 10 years to 1mm jobs. So far, the number of programmers in the US are estimated based on their employment, it would be really hard to estimate the number of programmers who don't have a degree and compare them with the number of jobs available to give you a neat conclusion. The issue is mostly raised in the context of tech talent being brought to US on H1B visas. They are good proxy for showing how many openings are there, as the companies struggling to find talent on local market, would search abroad. 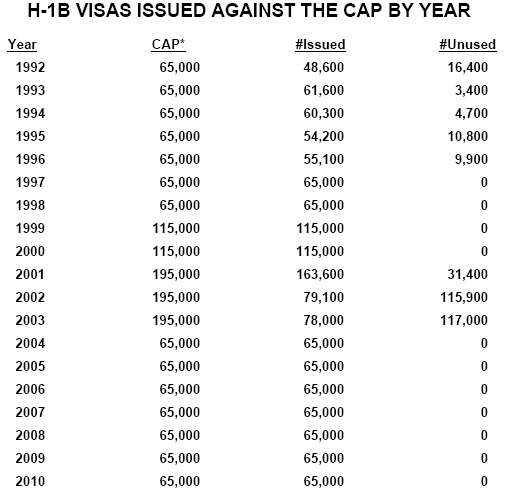 In 2013 businesses made 909,465 certified requests for H1B visas. Table 1 on the left shows that the top 10 demanded H1B occupations were in either computer technology or finance, representing 77 percent of the total, or 700,000. The rest were in fields that ranged from medical professionals and scientists to teachers and business administration analysts. Computer technology jobs, including computer programmers and software developers, accounted for 647,653, or 71 percent of all visas requested. Accountants, auditors, and financial and management analysts accounted for 53,433, or about 6 percent of all visas requested. It's safe assumption to make, that number of open positions is at least as big as number of requests for H1B visa. Request can only be made once candidate is actually offered the job. Another good indicator, that H1B correlate to shortage of tech talent is the fact that in years following the dot-com crash of 2001, the numbers used dropped significantly, as the local talent became available. Prior to filing any petition for a H-1B nonimmigrant pursuant to the application, the employer took or will take good faith steps to meet industry-wide standards to recruit US workers for the job for which the nonimmigrant is sought, offering compensation at least as great as that required to be offered to the non-immigrant. The employer will (has) offer(ed) the job to an equally or better qualified US worker. the wages must be above prevailing wages for same position in same region (for example you cannot bring a software developer to San Francisco on H1B and pay them less than $114,400/year). The wage paid to other employees in the company who do the same work. The prevailing wage for that occupation in the geographical area. The employer must make similar attestation regarding non-wage benefits offered. Another set of counter arguments is that if there was shortage, then why don't wages increase and unemployment decrease? These arguments also fail the fact check. According to data from Dice, just in 2012 alone the salaries grew 5.3% YtY, way above national average. Unemployment among software developers was 3.8%, less than half of national average. While using BLS data, the above analysis was performed by Edward Lazowska, a professor of computer science at the University of Washington. Unemployment rates for STEM majors may be low, but not all of those with undergraduate degrees end up in their field of study — only 13 percent in life sciences and 17 percent in physical sciences, according to a 2013 National Science Foundation survey. Computer science is the only STEM field where more than half of graduates are employed in their field. And if I'm allowed some related thoughts, although the question was tagged with US, the situation that CS/IT graduates fare better than the STEM average in finding a job in their field of study doesn't seem to hold in other Anglophone countries; e.g. in Australia. So frankly any inferences based on US data of a global shortage of developers seems even more tenuous. “In 2011, the European Union was faced with 300,000 unfilled vacancies in the ICT sector; if this trend is not checked, there could be as many as 900,000 unfilled vacancies by 2015,” said the official conclusions of an October 2013 summit in Brussels. “This skills mismatch is detrimental to our economic and social policy objectives,” added the text, signed off by all of the EU's government leaders, who promised action. But in reality, the number of unfulfilled potential jobs in the ICT sector remained more or less the same in the following years, at around a third of the expected figure. In 2012, the figure was around 274,000. In 2015, Empirica said there were 373,000 open posts, “so the actual shortage is not as massive ... as feared two years ago”. One year later, Empirica said the skills gap figure was 270,000. In its reports, Empirica offered estimates based on different scenarios, but it was not uncommon for commissioner Ansip's predecessor for the digital agenda, Neelie Kroes, to take the highest figure, saying that “Europe faces an ICT skills gap of nearly one million workers”, without mentioning a year or any caveats. The researchers had also stressed that what they calculated was a “demand potential” or “job potential”, not actual expected vacancies. 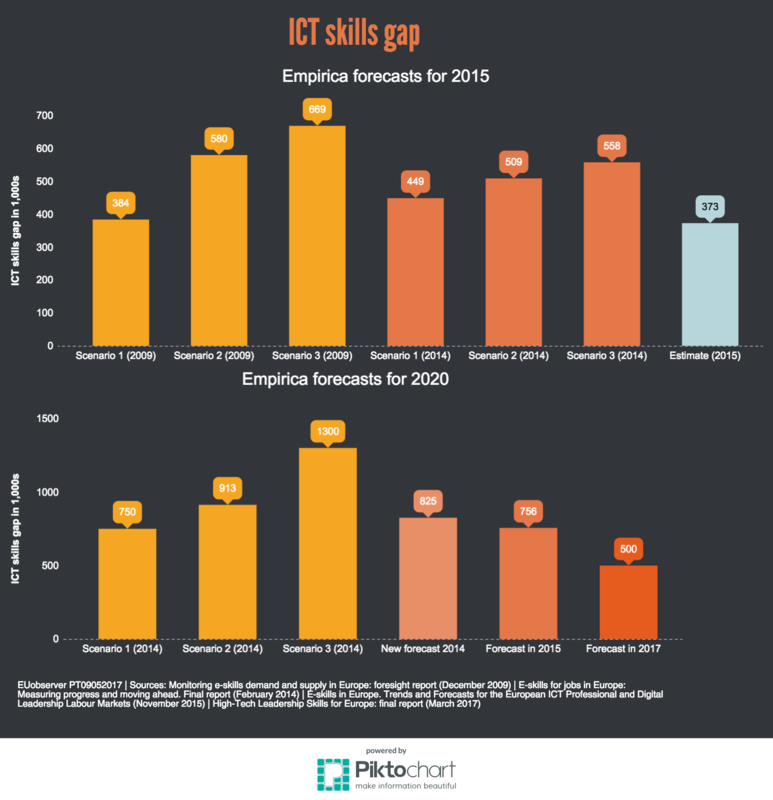 “It should be seen as a (theoretical) figure describing the demand potential for new ICT jobs which ... could theoretically and additionally be created in Europe due to an e-skills demand likely to occur especially in the years closer to 2020,” the researchers wrote in 2014. “Vacancies that cannot be filled year after year will go away – projects cannot be realised, tenders not submitted, innovations will simply not be made”, they added. That's why vacancies don't simply accumulate (linearly). Even high-demand tech roles have seen limited wage increases, the report found. Applications developers, security specialists, and other coveted positions have seen annual average job growth rates exceeding 7% over the last five years, while professions related to management and analysis of tech systems have grown at CAGRs about 3%. However, the wages for all of these roles have only growth around 3%, which suggests an efficient labor market, the report noted. Further, over the past four years, the number of students graduating with degrees and diplomas in computer science has grown faster than the number of new tech jobs. "This suggests that any tech talent shortage is getting better — not worse — from a training and development standpoint," the report stated. The report goes on to say that any "skills gaps" involve experience in hot technologies do jour (like mobile apps nowadays) and/or less attractive work locations; geographical areas identified (via salary growth): Rhode Island, West Virginia, Montana, and Washington State. Not the answer you're looking for? Browse other questions tagged united-states economics software .